I would eat there every day, if I could. And I would eat the same thing. Hey, if I find something I like, I order it again. After creating this recipe, I can eat it every day, or any day that I wish. It is easy and uses ingredients that you probably have in your pantry. Here is my recipe, step by step. First, make the sauce and set it in the fridge for later. Recipe link is at the bottom of this post. Next, take 2 semi-frozen chicken breasts (Costco size). Cut them against the grain, in thin slices. A serrated bread knife works well. Wonder why it's semi-frozen? Try cutting raw, slimy chicken into thin slices ... just doesn't work. Next, get your brown rice cooking ... brown rice takes 45 minutes, so get it going! I keep my brown rice in an used ice cream bucket in the freezer, as it can go rancid. I use 2 c. water to 1 c. rice. It will be done by the time your chicken and sauce is done. 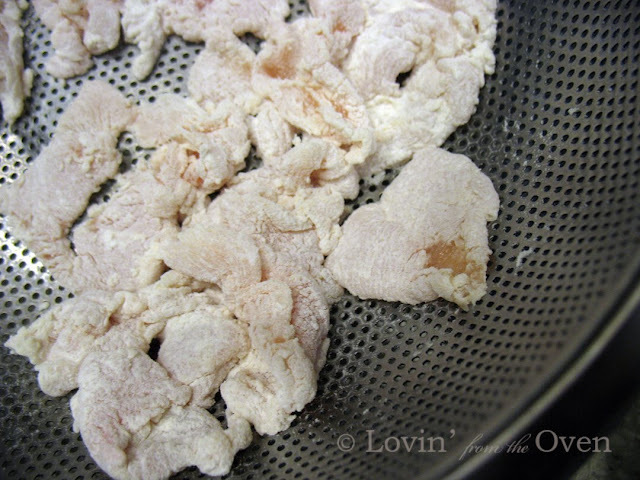 **Now take a cup of flour, sprinkle some white pepper in it; and whisk in a few chicken pieces. I used to do this by hand...I finally got smart and used stainless steel tongs instead. Saved my fingers from getting "flour glue." 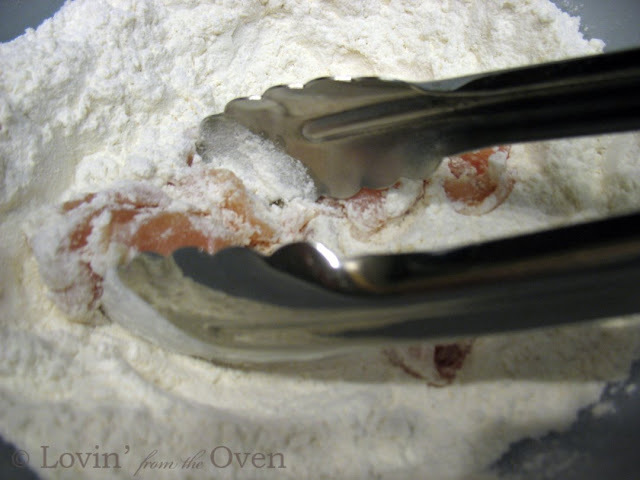 I put my floured chicken in a metal strainer; shake the excess flour back into the bowl. This will keep a lot of excess flour accumulating in the bottom of your frying oil. 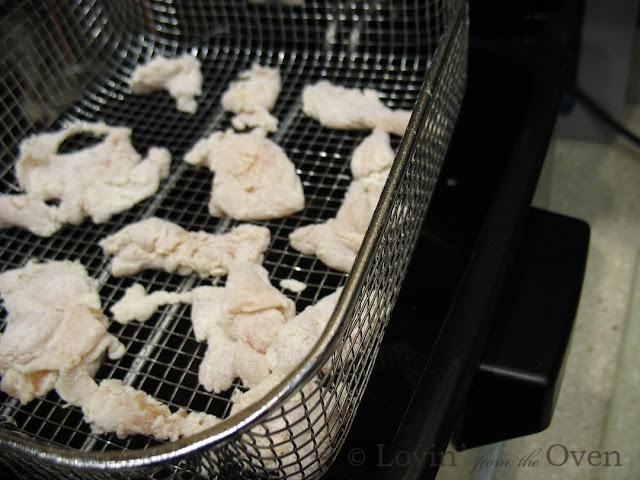 I then put my pieces of floured chicken in the basket of my fryer. 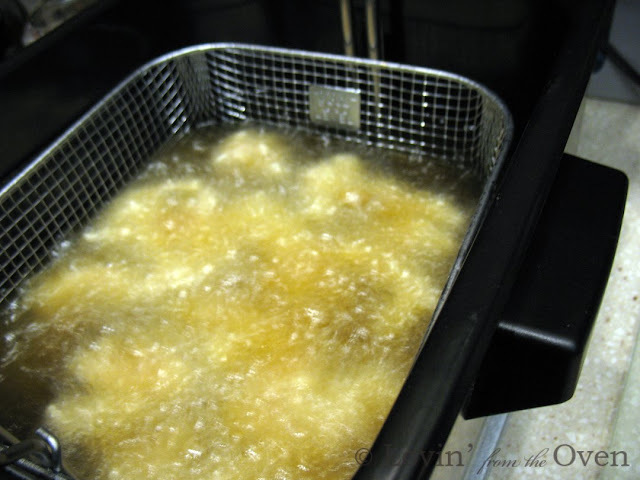 I have used my stove top wok or a couple of inches of oil in a saucepan to fry my chicken ... then I found this beautiful fryer at Costco for $40. Worth every penny. 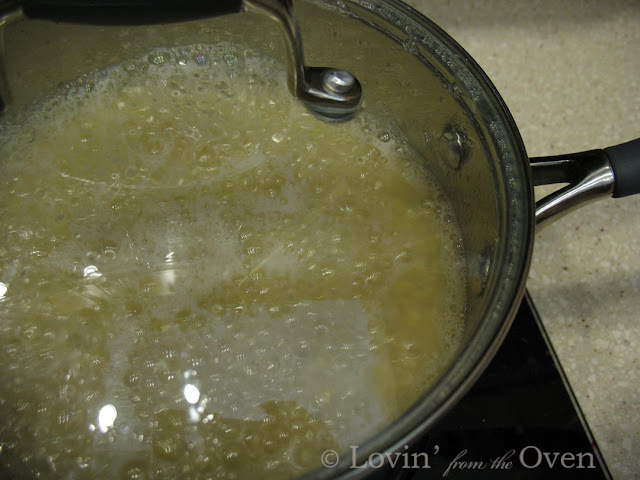 You can use a deep saucepan with 2" of oil, instead of a deep fryer. I drop the basket and immediately, the bubbles start...Dang it...did I get grease on the camera lens? Better not get too close! After about a minute, the bubbles subside and the chicken is ready to take out. Look at all the chicken I get from 2 chicken breasts! A good way to stretch your food dollar. These babies drain on a wire cooling rack over paper towels that are resting in a cookie sheet. Makes cleaning up so much easier! Now it's time to get my wok ready. Any large skillet will do, really. I put the crushed red pepper flakes in the oil (only a little...my poor tongue can only take so much...I put the rest on the table for the other spicy eaters in the family). 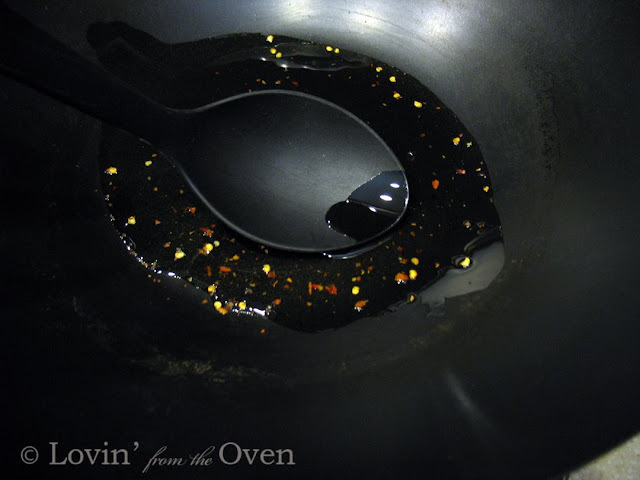 Warm up the flakes a little ... it infuses all the flavor into the oil, which will make your dish taste so much better. Turn off the stove and put the cooked chicken into the sauce. Stir until the chicken is completely coated. TaDa! Here it is...in all its glory. Delish. Try it, you'll like it! Add more red pepper flakes if you like it HOT! 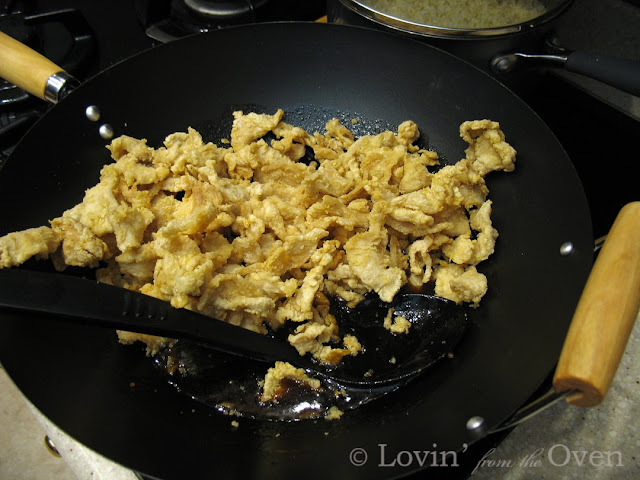 **You can stir fry the thawed chicken pieces in a small amount of oil instead of dipping them in flour and frying them. Put water and rice into a medium saucepan. Stir. Cover and put over med-high heat. When water comes to a boil, reduce to low. Remove lid, fluff with a fork. Mix sauce ingredients together. Cover and store in the fridge. 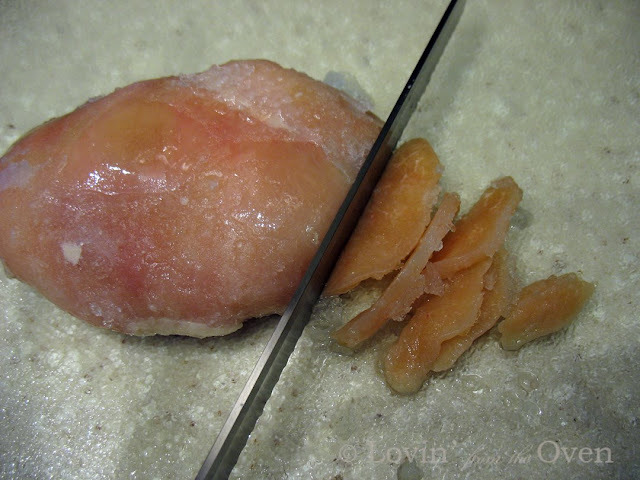 Slice semi-frozen chicken in thin slices. Put oil in wok on med-high (375degree) heat. In a large mixing bowl, combine flour and pepper. 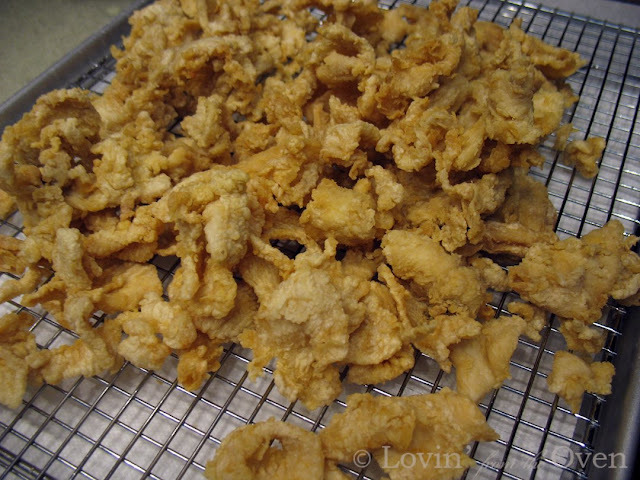 Using a few chicken pieces at a time, dip into flour mixture. Shake off excess (or use a sieve). Put coated chicken pieces into hot oil. Fry up to a minute; until golden brown. Drain chicken pieces on paper towel. Repeat until all chicken pieces are cooked. 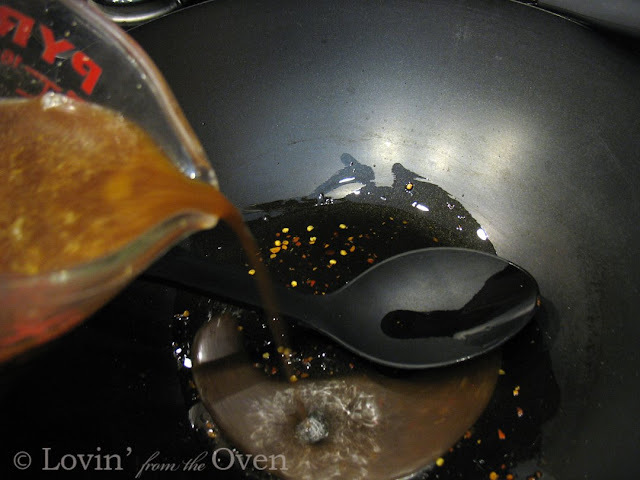 If using a wok, drain all but 1-2 T. of oil. Put chili peppers in oil. Warm up peppers on medium heat for a minute or two. Slowly pour sauce into hot oil. Stir constantly, until sauce thickens up. Put cooked chicken pieces into sauce. Stir to coat chicken thoroughly. By they way - I love the step by step pictures! From Lisa via Facebook: Frieda! The General Tsao's chicken was to die for!!! Thanks! Could you just make up a weekly menu so I can make everything you make! 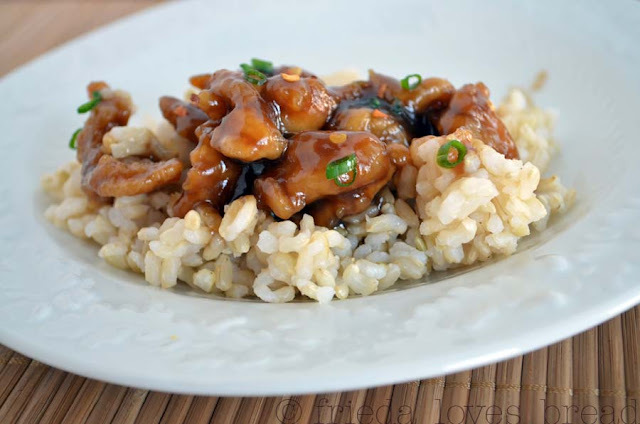 I haven't been able to find a General Tsao's recipe that I've liked. I'm going to try this. Great minds think alike with cutting up chicken! 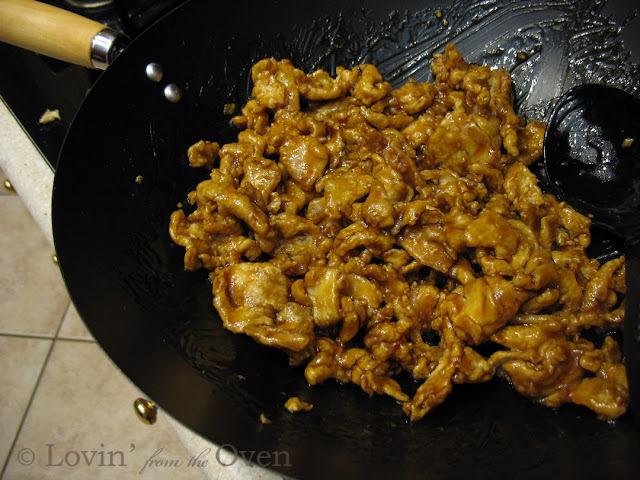 I just posted a recipe for Stir Fried Chicken and our pictures are almost identical! So delicious! This a recipe I will try for sure! That really looks and sounds good.I dom believe i will try this one.Juat 1 questio,how do you make your sauce? The recipe link is under the last picture. Click on it and you will find the recipe with ingredients and measurements for the chicken and sauce. Enjoy! the recipe for the sauce for the General Tao's chicken recipe was not at the bottom of the post. Hi Mary Jo ~ thanks for stopping by! The links for both the 4x6 and full page recipes are at the end of the post. Click on "4x6 printable recipe" or "full page recipe" under General Tao's Chicken and it will direct you to the entire recipe. 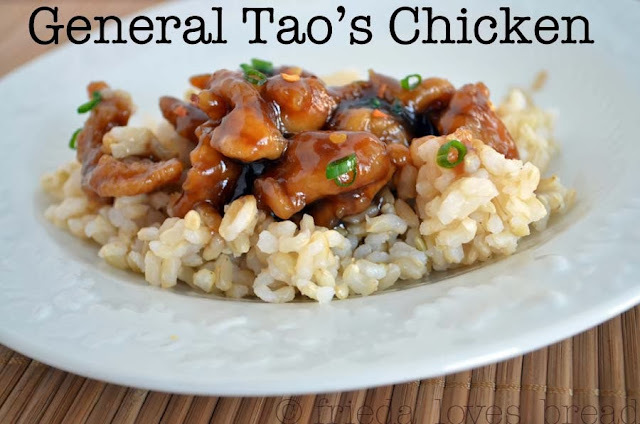 Look for the words, "General Tao's Chicken" at the very bottom of the post. You will see two recipe links there: 4x6 and full page. No recipe for the sauce at the bottom. The sauce is included in the printable recipe links (4x6 and full page)just below "General Tao's Chicken" at the bottom of my post. Enjoy! 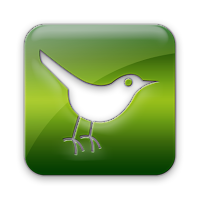 I have made this in a sugar free version: I used Stevia in the Raw with 1/8 tsp molasses (for color). Then I used the sauce over pork with stir-fried vegetables and Basmati rice. YUM!!!!!!!!! I loved it! Perfect! So nice of you to share your version ~ love it! It blows my mind when people see a great recipe,then comment how they change it??? I love how my readers not only change a recipe to meet their needs and tastes, but share it with others. Not everyone wants sugar in their recipes and like to use an alternative. 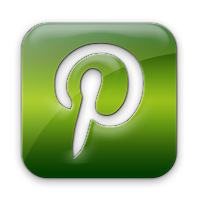 So excited I found this blog, can hardly wait to get cooking! Thanks for the review! I love how you can stir fry the chicken (instead of deep frying it) and tossing it with your favorite stir fry veggies.